PowerCap® Active™ (Patent Granted) is a lightweight, firm fitting, ergonomically designed positive pressure respirator, designed to protect the user from dust and most airborne particulate pollutants to EN12949+A2 TH1P. PowerCap® Active™ excels in very dusty environments within light industry (machining and milling), agriculture (livestock, poultry farming, grain silos), landscaping, and food processing. 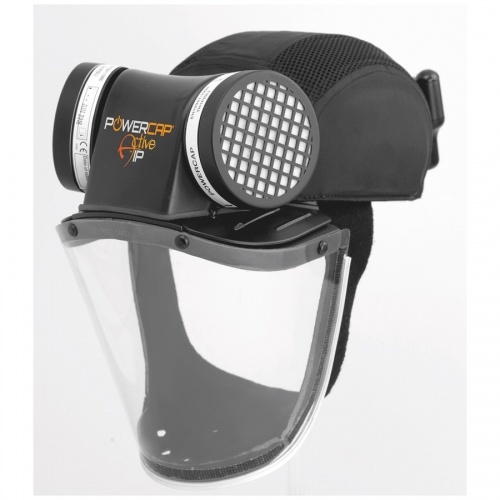 PowerCap® Active™ is a unique alternative to disposable masks, giving improved comfort, safety and efficiency to the wearer. • Powered Air - Respiratory protection to EN12941:1988 TH1P. Assigned Protection Factor 10 (UK classification) equivalent to an EN149 FFP2. Mask gives a cooling, comfortable supply of filtered air at 160 litres per minute eliminating breathing resistance and visor misting. • Easy To Use Charging Dock - Each battery lasts 8 hours, one can be charged whilst the other is in use. The battery can also be charged whilst still attached to the cap, and the whole unit can be conveniently sat in the charging dock, ideal for overnight charging.